Nintendo has had a quiet hit puzzle series in its back pocket for over 20 years in the form of Picross. These “picture-crosswords,” or nonograms as they are known outside of Nintendo’s branding, give players numeric clues to filling in a mosaic. It’s a relatively simple puzzle that is both curiously soothing and infuriatingly addictive. Read some numbers, mark up some tiles, and hey, you’ve made a pixel-art strawberry! It’s a lot of fun, trust me. Just a few weeks ago, Nintendo announced Pokémon Picross, a “free-to-start” entry in the Picross series with a healthy coating of Pokémon paint and another step forward in Nintendo’s continued experiments with in-app purchases. The company has had some smashing successes (the wondrously charming Rusty’s Real Deal Baseball) and some upsetting disappointments (the cash-grab Pokémon Shuffle) with these experiments in the past. How do in-app purchases and a marketable set of mascots affect the simplistic charms of Picross? The most obvious change are the Pokémon. Each puzzle represents an encounter with one of the collectible monsters, and solving it adds the critter to your team. 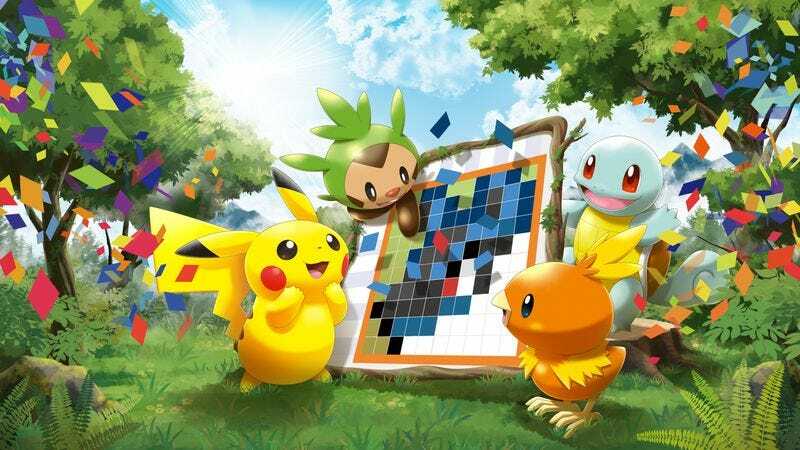 Equipping those Pokémon before starting a puzzle allows you to use their special skills—abilities like automatically filling in areas of the grid, highlighting clues ready to be filled in, and slowing down the clock. These special abilities are optional, so puzzle purists don’t need to use them if they don’t want to, but many of the additional challenges attached to each puzzle ask you to use a specific Pokémon or powers. Opting not to use them is tantamount to refusing to play the game, so it’s best just to get used to a little help. An example of a Picross puzzle in progress. Who’s that Pokémon? That assistance is much appreciated, though, when the game’s restrictions as something that’s “free to start” become apparent. First there’s the “energy meter,” which loses a notch with every tile you flll in. If your energy gets too low, it becomes impossible to solve puzzles, forcing you to either wait a few hours for the energy meter to replenish on its own or spend some in-game currency to extend the life span of your energy meter. That in-game currency, called Picrites, is the real troublemaker. Let’s just call Picrites what they are: fake money. This fake money is awarded for routine tasks, like clearing all the puzzles on a map, completing the additional challenges, or passing the daily training exercise. Early on, the game hands fake money out with great frequency to create the illusion of riches. “Oh, you’ve got so much fake money! That was easy! If things keep going like this, you’ll never run out of fake money!” Once that fake money is spent on things like opening up new maps and extending the energy meter, though, it comes less often. As the game stops handing out fake money, the only real way to progress is with real money. That’s to be expected with most free-to-play games—spending actual cash provides the advantage of not having to wait for the game to give you the things you need to continue—but Pokémon Picross quickly clarifies that it is free to start, not free to play. Challenges begin to require Pokémon that you won’t encounter for several maps, locking away that fake money until you’ve spent significantly more fake money to get there. Within a day of play, I had cleared every challenge possible and had only half the fake money needed to open the seventh map. Where once the energy meter kept me from playing for more than a half-hour at a time, now the road blocks kept me from playing indefinitely unless I bought more fake money with my own real money. At a certain point, once they’ve accumulated—or used real money to buy—enough fake money, players are rewarded with unlimited fake money, essentially unlocking the entire game and allowing you to play without fear of obstruction. Even with a perfect record accumulating money in-game, though, I estimate that reaching that lofty unlimited count would cost at least 30 real-world American dollars, plus tax. With six standalone Picross titles on the eShop at $6 each, people could pick up any two of those games and get just as many puzzles at less than half the price—albeit with none of the Pokémon. As is, Pokémon Picross may make for an excellent introduction to the Picross style of puzzle. Once you’ve dipped your toe in the puzzle waters, though, there are significantly more affordable (and less frustrating) ways to scratch that itch.